Granny Squares are some of my favorite quilt blocks. They're a classic that calls to mind snuggling under well-loved, almost ragged quilts at Grandmas' house over summer break. A Granny Square quilt has been on my Quilting Bucket list for a while, and I finally got around to piecing one. A few years ago I made out like a bandit at Denver's Quilt Show after spending an entire day combing through bargain and clearance bins. One of the finds I made as a plastic bag of 400 3" squares for $2. Great price for precuts! I used those squares as the foundation for the Granny Squares Quilt top. and an old sheet because I'm on a budget! When I designed the blocks, I cheated a bit. Traditionally Granny Square blocks use half squares triangles for the background fabric. I used only squares and rectangles and set the blocks on point so that piecing would be fast and easy. This quilt top measures 88 x 106" and is just shy of a true king sized quilt, so I wanted to use as little thread, fabric and time as possible. Unfortunately I have the habit of piecing together quilt tops and the Granny Squares Quilt is no exception. I don't have a batting large enough for it, so I'm saving up my monthly quilting budget to buy one. Hopefully I should have enough by October. I feel like a little kid saving up my allowance. 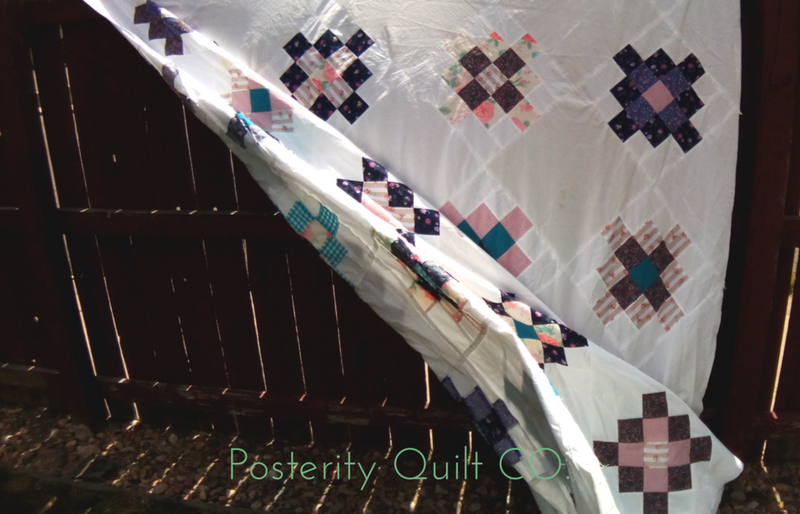 But actually quilting this beast is going to be an adventure! I'm planning on top stitching 2 1/2" lines to mirror the Granny Squares. However, I am hoping that once the quilt is finished, that it will be a nice hint to Handsomepants that we should upgrade our bed. I don't necessarily need a king, but the double mattress that I've had since I started high school is starting to get a little worn. Goose always helps me stage my quilts, she's such a help! If you're interested in making your own Granny Squares quilt, you can download the pattern HERE. 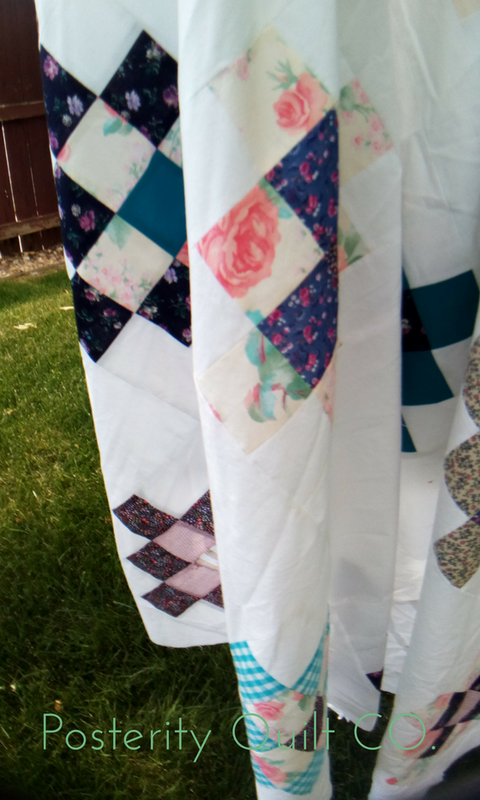 Newer PostFarmer Girl Vintage Quilt: Progress! Get some quiltspiration on Pinterest. 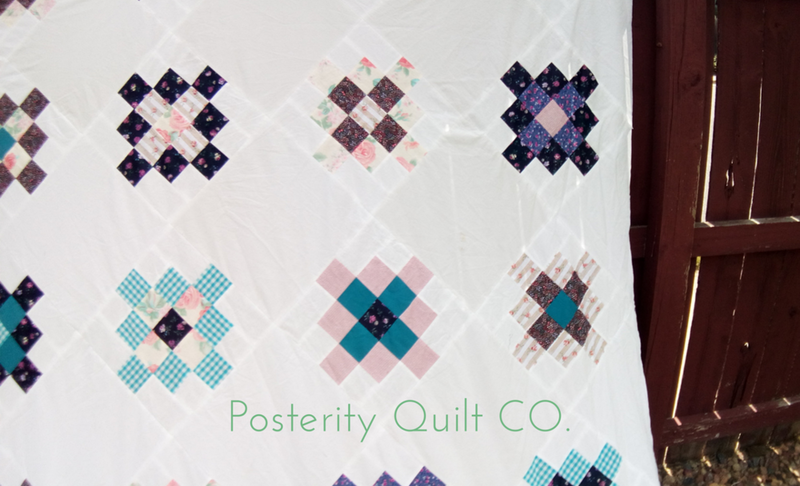 Visit Rita Wahn / Posterity Quilt Company's profile on Pinterest. The links I provide are unaffiliated. I do not receive any compensation for providing links to other sources.